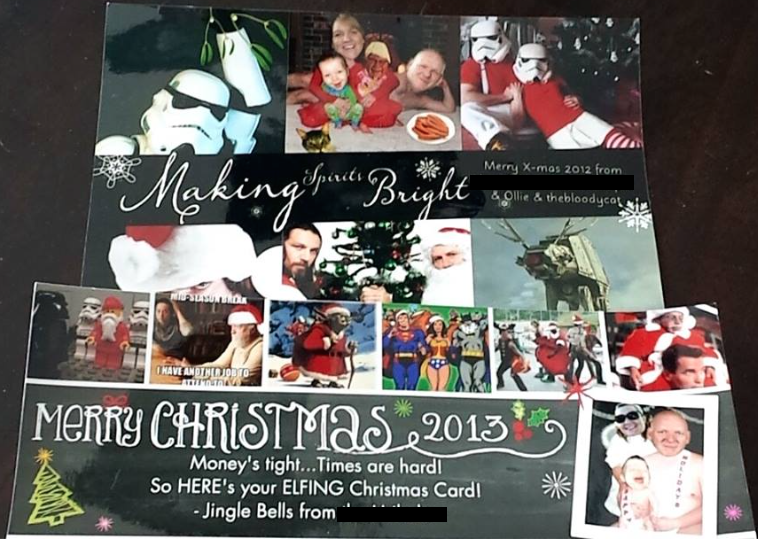 Home Humor Parenting Humor Parenting Tips Who Wants One Of Our Shameless Semi-Famous Holiday Cards? 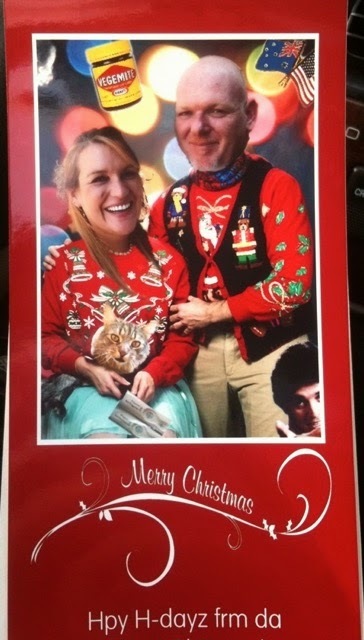 Who Wants One Of Our Shameless Semi-Famous Holiday Cards? You see, he takes a horrible card from the internet, and then sticks our heads on it. This first year, I was pregnant with Ollie, so he added Professor The Cat and my pregnancy tests. (THE MAN IS NOT RIGHT!) If you look close to the left side of my head you can see the lady's fuzzy grey hair sticking out. Then, once he's added our heads, he starts adding all kinds of "Important" stuff. You know, important stuff like, sausages, Vegemite, Eric Estrada, our national flags, and if look really close to the top left corner... that's Ollie's ultra sound head! As you can see, the man has no shame. And...well... that's part of why I married him. He hides little things all over the card like a Where's Waldo game, picks horrible photos, and makes up catchy phrases that he shoves in there too. Every year, readers reach out asking for a copy, which I send, until we run out. So this year, FTD is going to make a special card just for First Time Mom & Dad readers! Full disclosure: It will be the same caliber of shamelessness as the prior years. ... But isn't our shamelessness the part you love the most? I am so thankful to all of you for your support, comments and coming back everyday to read our nonsense! So if you would like a small token of thanks, please make sure you are following us on the First Time Mom and Dad Facebook Fan Page where we will be posting the card very soon for you to download.